This natural specimen of kyanite in matrix is 9" long x 4.2" x 3.7"
This natural blue kyanite decorator specimen has dozens of blade-like blue kyanite crystals arranged in interesting patterns, embedded within a matrix of translucent to semi-transparent quartz crystal. 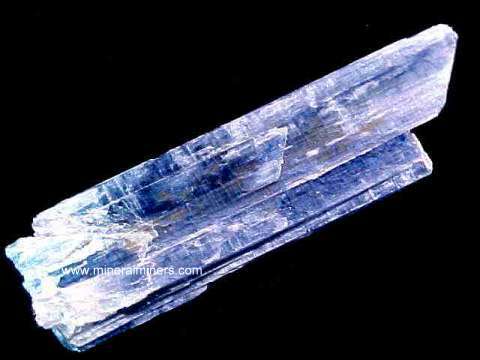 The longest kyanite crystals are 5.5 inches long. 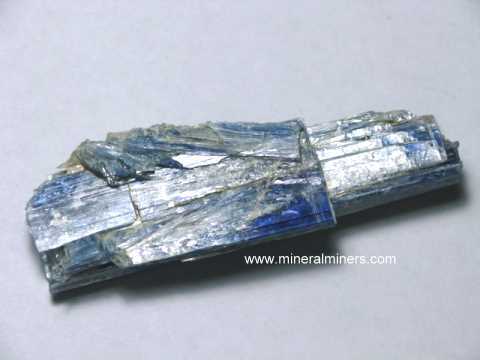 See also an opposite side view of this blue kyanite in quartz decorator specimen. These large size blue kyanite earrings were handcrafted in sterling silver and then set with 1.5 inch long polished blue kyanite crystals! The overall length including the hoop is 2.3 inches long. The kyanites have a very thin flat shape so they weigh very little. These polished blue kyanite crystals are translucent to semi-transparent, and they have beautiful blue natural color. This pair of superior grade blue kyanite earrings is bezel set in 925 sterling silver dangles with beautiful 7x5mm oval faceted genuine blue kyanite gemstones weighing 2.10 carats total weight. These natural color blue kyanite gems were faceted from blue kyanite crystals mined in Nepal. See also a side-view image of these natural color blue kyanite earrings. This pair of superior quality kyanite gems face up clean with faint natural inclusions visible under closer inspection, and they have dark blue 100% natural color - these genuine blue kyanite gemstones are unheated and untreated. Blue kyanite gemstones weigh 3.30 carats total weight! This pair of natural color blue kyanite earrings is bezel set in 925 sterling silver stud earrings with 8x6mm oval faceted genuine blue kyanite gemstones weighing 3.30 carats total weight. These natural color blue kyanite gems were faceted from blue kyanite crystals mined in Nepal. See also a side-view image of these natural color sterling silver blue kyanite earrings. This pair of natural blue kyanite gems face have faint natural inclusions with wonderful light blue 100% natural color - these blue kyanite gemstones are unheated and untreated. This large blue kyanite pendant was handcrafted in sterling silver and then set with 1.6 inch long polished blue kyanite crystal! The overall length of this pendant including the bale is 2.2 inches long. The kyanite has a thin flat shape. This polished blue kyanite crystal is translucent to semi-transparent, and it has beautiful blue natural color. 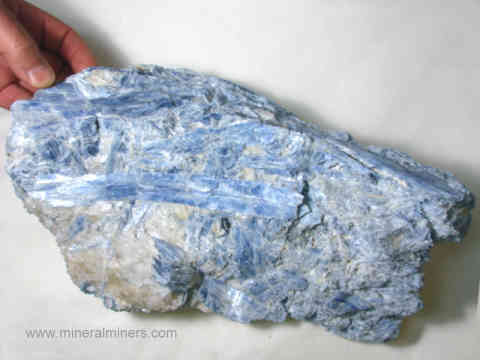 It will make a wonderful kyanite necklace! This natural blue kyanite pendant matches nicely with the earrings displayed above (item kyaj194). This beauutiful blue kyanite pendant was handcrafted in 925 sterling silver and then set with a 9x7mm oval faceted gem of natural color blue kyanite, and with a 6mm round fresh water pearl. The kyanite gem has beautiful deep blue 100% natural color - it is unheated and untreated. It looks like a blue sapphire! This deep blue kyanite gem has faint natural inclusions with color zoning visible under close inspection. This natural color blue-green kyanite pendant was handcrafted in 925 sterling silver with an open back setting and set with a 20x17mm pear shaped cabochon gem of natural blue-green kyanite. It will make a wonderful kyanite necklace! Natural Blue Kyanite Necklace, 87 inches long! This extra long kyanite necklace is 87 inches long! It can be doubled up twice as shown and worn as 4 strands of about 21 inches each. This natural kyanite necklace has genuine blue kyanite beads that were ground and polished from natural kyanite crystals mined in India. These beautiful kyanite beads are translucent to semi-transparent, and they have lovely blue natural color. They were polished into free-form shapes which were then drilled and strung together with occasional accent beads of genuine black onyx. The photo at left shows a close-up, see also a full-view of this natural kyanite jewelry design. This wonderful multi-gem blue kyanite bracelet was handcrafted in sterling silver and set with seven completely natural gemstones of ametrine, moonstone, and blue kyanite! The two lightly included ametrine gems measure from 21x16mm up to 26x13mm, the two moonstone cabochon gems measure from 16x14mm up to 21x14mm. The three blue kyanite cabochon gems measure from 31x10mm up to 31x26mm. See also a full view photo of this blue kyanite multi-gem bracelet. Set with nine natural color blue kyanite cabochons weighing 23.5 carats total gem weight! This beautiful blue kyanite bracelet was handcrafted in 925 sterling silver and set with nine completely natural blue kyanite cabochon gemstones! These genuine kyanite gems are unheated and untreated. The lightly included 9x7mm blue kyanite gems are semi-transparent to transparent with some natural color zoning. See also a full-view photo of this natural color blue kyanite jewelry design. This solid 14k yellow gold pendant is set with a natural color dark blue kyanite gemstone. This dark blue kyanite gemstone appears almost black it is so dark, with intense blue flashes deep within under bright light. See a side view of this wonderful deep blue kyanite pendant. This ultra deep blue kyanite gem has very faintly visible natural inclusions. It has very beautiful intense blue natural color that looks like an extra fine color Ceylon dark blue sapphire! This genuine blue kyanite gem is unheated and untreated, and it was faceted from a natural blue kyanite crystal mined in Nepal. This solid 14k white gold pendant is set with a natural color dark blue kyanite gemstone. This dark blue kyanite gemstone appears almost black it is so dark, with intense blue flashes deep within under bright light. The photo at left is a front-lit view. See a back-lit side view of this wonderful deep blue kyanite pendant. See also a front view facing up of this natural color dark blue kyanite jewelry design. This ultra deep blue kyanite gem has faintly visible natural inclusions. It has very beautiful intense blue natural color that looks like an extra fine color Ceylon dark blue sapphire! This genuine blue kyanite gem is unheated and untreated, and it was faceted from a natural blue kyanite crystal mined in Nepal. This blue kyanite pendant is set in solid 14k yellow gold with a natural blue kyanite gemstone which was faceted from a natural kyanite crystal mined in Nepal. 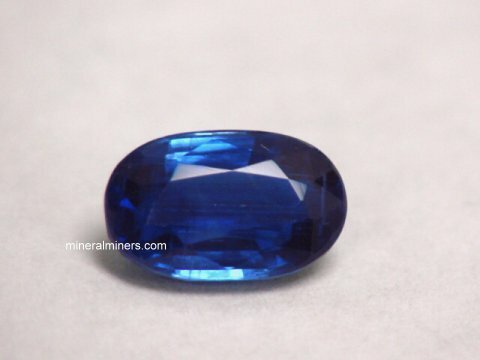 It has very beautiful deep blue natural color - this beautiful gem is both unheated and untreated. It looks like an extra fine color Ceylon blue sapphire. The gem in this extra fine color blue kyanite pendant has good brilliance with faint natural inclusions that are visible under close inspection. This blue kyanite pendant is set in 925 sterling silver with a superior quality natural blue kyanite gemstone. This beautiful gem was faceted from a natural color blue kyanite crystal mined in Nepal. See a side view of this rare quality natural blue kyanite pendant. It has very beautiful deep blue natural color - this extra fine color blue kyanite gem is both unheated and untreated. It looks like an extra fine color Ceylon blue sapphire! The gem in this extra fine color blue kyanite pendant has good brilliance with faint natural inclusions that are only faintly visible under close inspection. See another photo of this extra fine natural color blue kyanite pendant. Kyanite Matrix Specimen Dimesions: 4.4" long x 3" x 1.8"
This natural mineral specimen has a few dozen blade-like blue kyanite crystals in quartz matrix. A couple of the kyanite crystals very clearly show evidence of natural plastic deformation (they appear to be "bent")! See also another view of this natural metamorphic mineral specimen of blue kyanite in matrix. 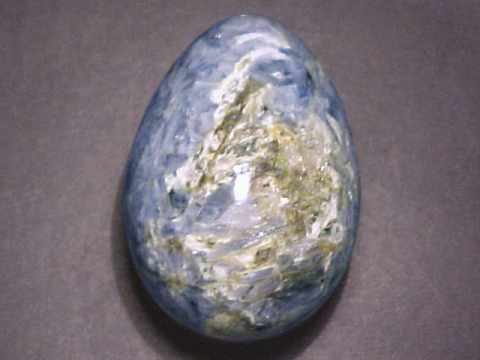 This natural blue kyanite egg was hand-ground and polished from a single chunk of intergrown blue kyanite crystals that was mined in Russia. Intergrown with the light blue kyanite is a small amount of quartz crystal, feldspar, and mica. This natural blue kyanite egg was hand-ground and polished from a specimen of intergrown blue kyanite crystals that was mined in Russia. Intergrown with the light blue kyanite is a small amount of quartz crystal, feldspar, and mica. Each one of our kyanites is completely natural, and they were mined in Brazil or in Nepal. You may have noticed that some of our kyanite crystals have blue color, some have green color, and some are dark gray to black. These are all natural color kyanite crystals. Here at mineralminers.com, we do not have any heated or treated kyanites, each of our kyanites is 100% natural! 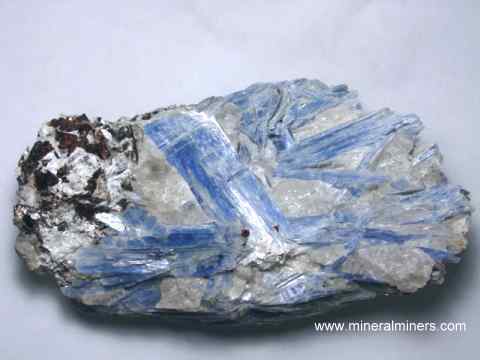 We specialize in superior quality natural kyanite crystals, gemstones and kyanite in matrix specimens. We do have more kyanites in stock, including some very rare quality kyanite crystals and some very large kyanite decorator specimens. We also have small kyanite mineral specimens available, and these inexpensive kyanite specimens have special volume discounts as well! We have natural decorator mineral specimens & crystals available in a very large variety of minerals including fine pegmatite specimens. Would you like us to inform you when we add on this page more collector grade natural blue kyanite in quartz mineral specimens of rare quality and unusually large size for use as decorator mineral specimens, as well as fine quality natural color blue kyanite gemstones & 14k gold blue kyanite jewelry items? We have a large inventory of natural blue kyanite items in stock, so be sure to let us know if you have any Blue Kyanite Items Special Request">natural kyanite special requests. Please contact our webmaster or our 'site' geologist with any questions or comments.